Being hooted and threatened by a mob of football fans is part of the match day experience of all umpires but rarer is when the hooting and rabid mob is gathered in the street and baying for your blood. This was the experience of Max Blumfield as he left the VFL Tribunal at Harrison House in August 1952. Blumfield’s car was surrounded as he left but he was whisked away, another colourful incident in a life full of them and which came to an end recently. Blumfield was one of only two remaining men to have both played and umpired VFL/AFL senior football. As a player, umpire, journalist and administrator Blumfield devoted his life to football but still managed to be a successful business man golfer and lawn bowler. Born in Pyramid Hill on 4 August 1922 the family moved to Murtoa in 1928. Leaving Murtoa in 1938 Max had been in Melbourne for three years studying aeronautical engineering at RMIT when South Melbourne recruited him from Amateur premiers Elsternwick and he began playing with the Reserves in 1941. A rover, his debut came in 1943 and he played intermittently over the next four seasons amassing 21 matches and kicking twelve goals. Perhaps the high point came in the 1945 finals series. His first (and only) senior match for the season was in the victorious Second-Semi-final side against Collingwood where he kicked one goal. Alas for Max his place in the ‘Bloodbath’ Grand Final team was taken by regular rover Reg Richards who had recovered from the influenza that forced him to miss the semi-final. Max was named emergency. He could then only manage three VFL appearances in 1946 and left for Prahran (VFA) where he played in the Reserve Grade premiership team. Having hung up his boots as a player Blumfield decide to give umpiring a try. 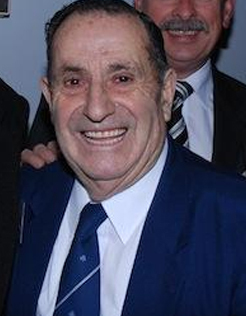 He joined the VFL Reserve Grade in 1947 and the following season was one of 29 promoted to the senior list. More umpires were needed as the various country leagues resumed after the Second World War and Max made the most of the opportunity. In 1949 he umpired four VCFL finals including the Euroa District League Grand Final. July 1951 saw him promoted to the VFL Reserve Grade and in August of the same year he made his debut in the VFL in round 15 at Glenferrie Oval earning him Heritage Number 215. He finished the season with three VFL matches and the Ovens and Murray Preliminary and Grand Finals. Over the next two seasons Max umpired 31 out of a possible 38 VFL home and away rounds. This included the 1952 Footscray versus St. Kilda match at Yallourn as part of National Round. Max’s run-in with Coleman occurred in the Essendon-Collingwood clash at Windy Hill on 2 August 1952. In the second quarter he gave Collingwood full back Jack Hamilton a free kick. Coleman asked Max what the kick was for, and Max told him. Coleman then went over Hamilton’s mark, and Max gave a second free kick. In his testimony Blumfield added, “Coleman said to me ‘Go and get a book of rules and read them. Later Coleman made an insulting remark”. Max’ final VFL senior match was in round ten 1954, a screaming finish with North goaling on the to steal a three-point win. Later in the season he finished his career with VCFL finals in the Wimmera, O&M, Latrobe Valley Bendigo and Ballarat Leagues. In all his career encompassed 37 VFL, 11 VFL Reserve Grade, 90 VCFL and 8 Tasmanian matches in eight seasons – an outstanding achievement. Not content with just umpiring Max also contributed to the VFLUA. He was elected to the Social Committee from 1951-53 and served on the Executive Committee in 1954. HIs connection with umpiring and football generally continued in a number of ways. Soon after retiring he worked on 3KZ radio with Phillip Gibbs and former Melbourne player Jack Mueller as a representative of umpiring answering radio requests on rules and other aspects of umpiring. From 1956-1960 he reported on football for The Age under editorship of Percy Beames and Ron Carter. Perhaps most influentially from 1961-1976 he was a member of the VFL Umpires Appointment Board and Chairman in 1965-66 and 1972. Throughout much of this period he was a defacto sponsor of the Association paying regularly for advertising in the VFLUA Annual Report. His business, (Sears) Morton Sales, a furniture and electrical appliance concern, also employed Alan Nash. From 2005 to 2007 Max took up the opportunity of Associate Membership and thus completed his ten years to qualify for Life Membership of the AFLUA to which he was duly elected. Given his previous contribution as umpire, Executive Committee Member and Board Member it is curious that Honorary Life Membership was not recommended decades ago. Few Associate Members qualify as handily as Max. One other playing connection remains – in later years he was a proud uncle when his nephew Justin Blumfield began a VFL playing career. Max also maintained his sporting interests. A keen golfer he was a member of the Heidelberg Golf Club and was the 1966 ‘C’ Grade Club Champion, He later became President and Life Member of the club something he also achieved with the Heidelberg Bowls Club to whom he gave 55 years service. For five decades Max was the last man to make the transition from playing to umpiring at the highest level but his career and life both on and off the field was so much more than that. His contributions were many and perhaps most of all he was liked by all who came to know him – a gentleman. Maxwell Herbert Blumfield died peacefully in his sleep at the Austin Hospital, Melbourne, on September 20, 2011 at 89 years of age.